Over the past 20 years, MLT is well-known for providing laser services for the printed circuit board industry. From single sided to multi-layer, double sided PCB designs in both rigid and flexible circuits (FPC), Micron Laser Technology has been an integral partner in advancing our customers’ manufacturing capabilities and product technology. Our goal is to assist our customers (PCB manufacturers) in growing their market share. If successful, our customers achieve volumes and enough laser application and process knowledge that eventually results in our customer internalizing the laser process steps. Our customers make up some of the largest international PCB manufacturers, original equipment manufacturers (OEM), and electronics manufacturing services (EMS) companies that serve the medical, electronics, telecommunications, industrial, communications, transportation, automotive, commercial and military sectors. 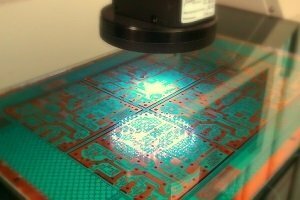 Having supported most every industry across thousands of electronic products and applications, our contract laser services are a cost effective solution to producing IPC compliant electronic circuit boards. Whether prototypes or volume manufacturing, one of our application engineers are ready to review your PCB design for manufacturability. As your PCB laser processing partner, we can suggest design guidelines that will reduce your laser processing cost and improve yields. To request a quote or discuss application details, contact our sales staff or submit a Request for Quote.